Chhabra Osteopathy has 3 convenient locations, making it easy for patients to find appointments at one of our osteopath clinics located near you. 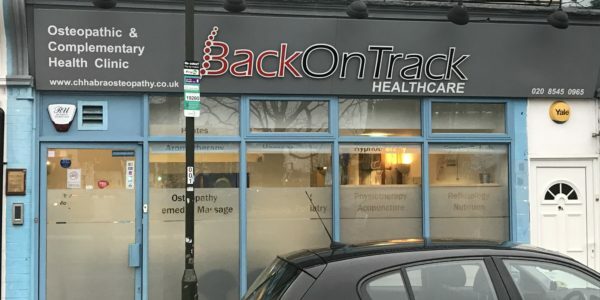 One of our clinics is near Wimbledon, in Merton Park and serves Raynes Park, Morden, South Wimbledon and Wimbledon Village. Wimbledon Chase train station is nearby and we are an easy walk or short taxi ride from Wimbledon mainline station. Chhabra Osteopathy Wimbledon is situated on Merton Park Parade, which is just off Kingston Road, near the Nelson Medical Centre, opposite Merton Hall Road. Buses 152, 163, 164 and K5 all pass en route from Wimbledon mainline and District line station and South Wimbledon (Northern Line) Tube station. Merton Park Tram stop and Wimbledon Chase Thameslink stations are 2 minutes gentle walk away along Kingston Road. If Wimbledon isn’t the closest clinic to you, we also have a clinic in Hinchley Wood. Having osteopathy near Esher, Claygate and Surbiton allows patients easy access from the mainline stations nearby, since Chhabra Osteopathy Hinchley Wood is on the K3 bus route from Surbiton towards Claygate and you can ask the driver to stop immediately outside number 19 Manor Road South. The clinic is on the right hand side of the main house and has its own independent entrance. If you are travelling by train, Hinchley Wood station is less than a 5 minute walk away- just across the bypass and 10 properties after the Shell petrol station on the same side. For those living further into Surrey, our Westfield clinic may be most useful. The Chhabra Osteopathy Woking Practice, at 1 Westfield Road, Woking, Surrey GU22 9LZ is situated within the BUPA Dental Care building, just a stone’s throw from the Bus 34 stop on Vicarage Road. Route 34 serves Guildford to Camberley via Woking. Bus stops for routes 462 and 463 (the Woking to Guildford bus service) are also situated nearby. The clinic is approximately one mile from Woking station. Being near Knapp Hill, St. John’s, Westfield and Old Woking, we look after patients from all these areas who live and work nearby.